UK Release Date - 25th November 1983. The last single from 'Pyromania' was released in November 1983. 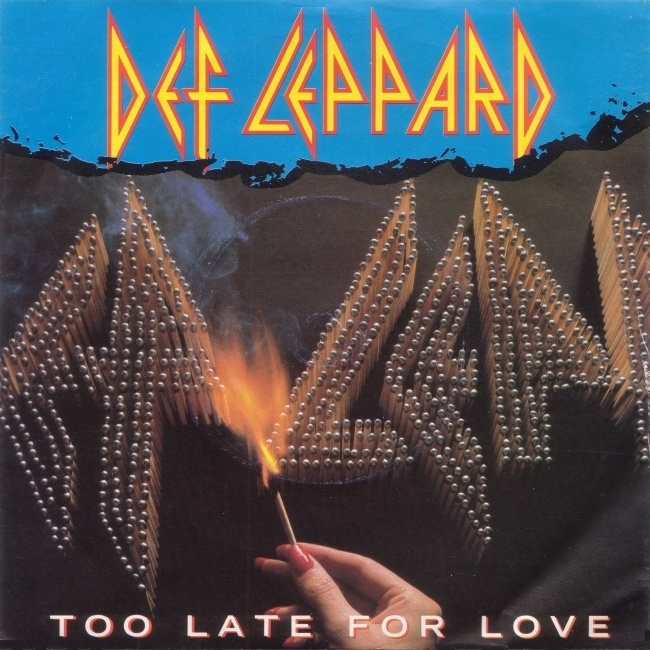 'Too Late For Love' was the first and only ballad released from the album. It failed to chart due to lack of radio airplay and no video. The song was only issued in the UK and released to help promote the three UK tour dates in early December. Only two versions were issued on 7 and 12". Both featured the US single Foolin' and the title track from the second album. The cover of the 7" and 12" singles were slightly different. On the 7" the song title was at the bottom of the sleeve in white. On the 12" it was at the top (below the band logo) and in yellow. The back cover of the 7" had red, yellow and blue colours and four insert live pics. One featured both Steve and Phil from the Foolin' video shoot. The back of the 12" had purple, yellow and red colouring and one insert live pic of the whole band during the Foolin' video. A very rare promo 7" was also issued with only "Too Late" written on the front cover. The back cover had blue, yellow and green colouring and featured an insert pic of the band at the Allentown WZZO football match wearing their green Def Leppard F.C. football kits. This has become a rare collectors item selling for up to £100. An early version of the song called "This Ship Sails Tonight" was played live on the December 1980 UK Club tour.